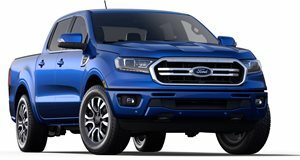 Are You The Next-Generation Ford Ranger? Fact: the Ford Ranger that’s recently gone on sale in the US is actually based on a platform from 2012. It's an updated version of the truck sold in overseas markets including Europe and Australia. So, given the platform’s age, wouldn’t a redesign make sense? From these images, that's exactly what Ford is thinking. Australia’s Wheels Magazine has posted pics of what appears to be the next-generation Ranger. The photos were supposedly taken only a week or so ago near Melbourne during what looks like a photo shoot. Wheels Magazine also thinks the truck we’re looking at is really a clay model because the windows are blacked-out. The redesigned truck, according to sources, is due to arrive in a few years for those overseas markets, but no timetable is available for the US. One look at these images and it’s immediately recognizable as a Ford due to many shared design cues taken from the 2020 Super Duty, such as the C-shaped headlights, general grille styling, squared-off fog light housings, and the two-tone split rear bumper. Wheels Magazine also reiterates it cannot fully confirm this is the next Ranger, but what else could it be? It should also be noted that the US market Ranger does not have much American input. The design was simply adjusted to meet American crash and emissions standards. Ford needed to re-enter the mid-size truck market rather quickly and the overseas Ranger offered the fastest solution, despite its age. Therefore, the next-generation Ranger, whenever it arrives, will have a lot more American market input. Ford has already begun to gather that data. Sources add the new Ranger will likely debut in 2021, but we don’t know just yet whether that also applies to the US. We’ll keep you posted if we learn any additional details.